The Elementary Division, composed of grades 1-5, is the level at which students solidify their basic academic skills, begin to develop high-order thinking skills, broaden their knowledge, and strengthen their values, sense of responsibility and leadership ability. In keeping with the Ojai Valley School philosophy, the Elementary Division integrates core academics with art, music, technology, foreign language, equestrian, physical education, woodshop, and outdoor education. These co-curricular offerings play a vital role in teaching students social and cultural values. The focus of the curriculum is on developing not only academic skills, but also responsibility, good citizenship and respect for oneself and others. There is an emphasis on promoting students’ understanding of the value of family community and cultural sensitivity. The academic structure is strong but flexible, sequential but responsive, and emphasizes the fundamentals of mathematics, reading, language arts, science and social studies. There are classes in beginning Spanish, library skills, art, music, woodshop, and computer literacy each week. The program is complemented by physical education, outdoor education, horseback riding, and performing arts. 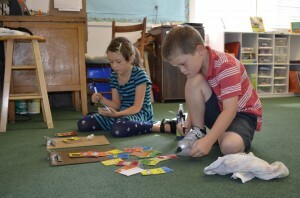 Our dedicated faculty members use materials and techniques designed for discovery and cooperative learning, as well as traditional classroom activities. Relatively small class size allows teachers to give a good deal of individual attention to each student.